Tomorrow is Poila Boishakh, the first day of Boishakh ushering in the Bengali New year. 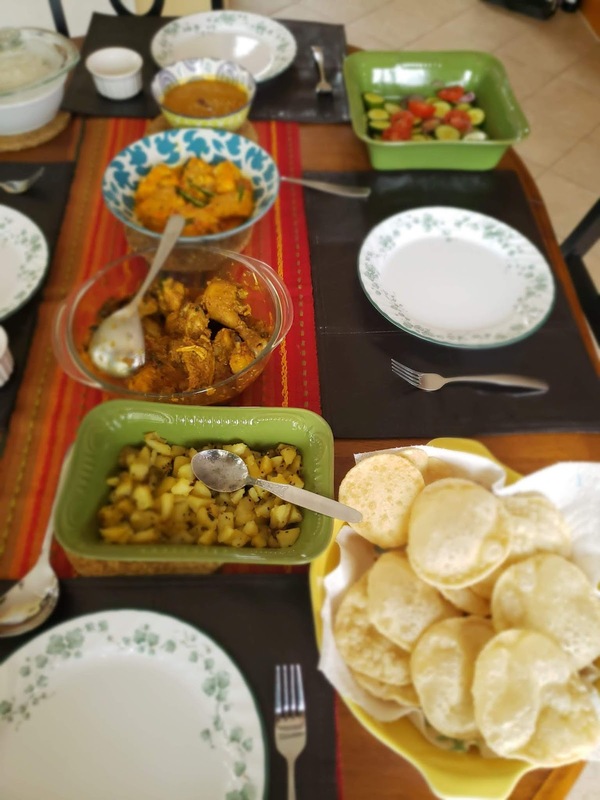 While the English NewYear involves a lot of hard work like late night partying, looking back, looking forward, making resolutions, blah, blah...the Bengali New Year is much more relaxed and laid back in style. (1) wearing new clothes (2) feasting at home (3) visiting stores and collecting single page Bengali calendars rolled in a narrow cylinder and cardboard boxes of sweets and shingaras. In addition to that there was the usual cultural stuff , involving Rabindrasangeet , because how can a Bengali celebrate anything without kalchar -- but I was not greatly interested in them. Now, #1 holds no attraction for me and it has been almost 30 years since #3. So that leaves us with #2 as the only way to usher in the New Year. Not necessarily at home but anywhere. Today, we had one of our classmates visiting us from Finland and so we had our Notun Bochor celebration a day early with lots of Bengali food at home. This Niramish Mangsho, is something I cooked last weekend and have been thinking of sharing with you but the week just got so busy that I didn't get a chance. Niramish Mangsho or "Vegetarian Mutton Curry" would sound like an oxymoron to most except a Bengali. To my ears, it sounds perfectly logical since I have grown up hearing about it. Every year, around Kalipujo, my Father would reminisce about one his Uncles, an ardent devotee of the Goddess Kali. This extremely spiritual Uncle, who practiced a strict vegetarian diet all 364 days of the year, would become the greatest meat eating glutton on the day of Kali Pujo. 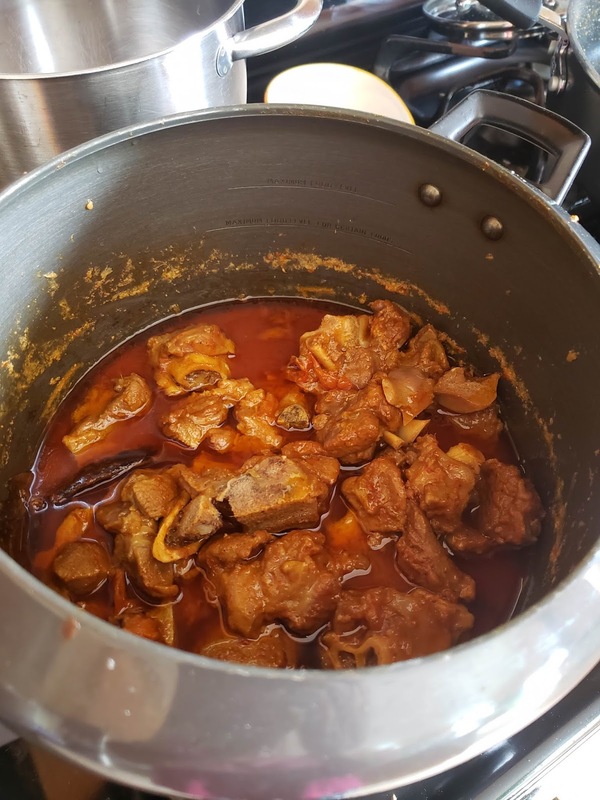 The sacrificial goat for Goddess Kali would be cooked without any onion or garlic and that mutton curry, labeled as "Niramish Mangsho" would be enjoyed by her devout followers as "maha proshaad" -- the blessed mutton curry!!! As a child I was awed by this show of reverence. How could someone forego meat for one whole year and the satiate his cravings on just one day? And that too with a mutton curry that was cooked without any onion or garlic. Must be very blehh in taste...I thought!! I might have have tasted that mutton curry during Kali pujo, a small piece as a portion of a larger proshaad, but it did not really make enough of an impact to my childhood palate. I preferred the "Robibar er Mutton Curry" cooked by my Mother on Sundays. Recently as I was trying to look up more about this Niramish Mangsho, I found that it had a lot of similarity with Kasmiri Brahmin recipe of Rogan Josh which too is made without any onion or garlic. Onion and garlic were not very popular ingredients in the Hindu kitchen yet and Asafoetida or Hing is the major flavoring agent in both the recipes. In Utsa Ray's book "Culinary Culture in Colonial India", he mentions the the first Bengali cookbook Pakrajeswar(published in 1831) and the second, Byanjan-ratnakar(in 1858). Ray says -- " Mutton recipes described there hardly prescribed the use of onion or garlic, something frequently used in Mughlai cuisine. The author of Pakrajeswar clearly stated that since people in the region hardly consumed onion, he had refrained from listing it as an essential ingredient in the recipes. Byanjan-ratnakar also did not include onion and garlic in its repertoire of recipes. It can be understood that the readers of Pakrajeswar were mostly Hindus who were not very accustomed to having garlic and onion in their food as yet." 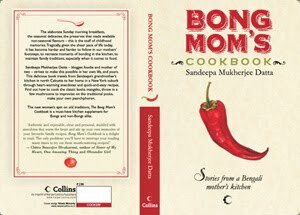 In the same book he also mentions Mukundaram’s Chandimangal composed in late 16th century, which has elaborate lists of what was being cooked in the families of the trading castes and mentions--"Generally, the spices used for cooking fish and mutton were asafoetida and cumin." 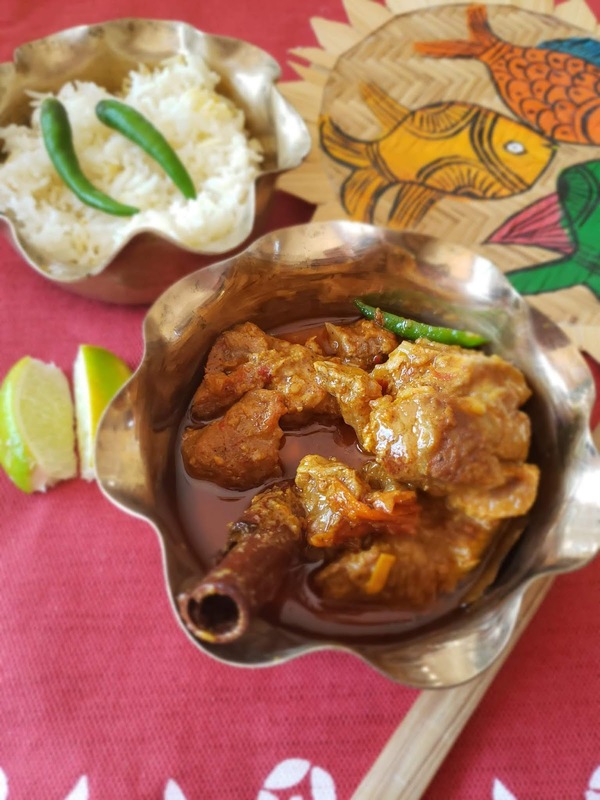 We can then extrapolate that Mutton curry cooked without any onion or garlic was the norm in Hindu Bengali families in those times and so "Niramish Mangsho" was not really an anomaly. It was therefore very natural that the goat sacrificed to the Goddess Durga on the ninth day (Nabami) of Durga Pujo and to Goddess Kali on Kalipujo was also cooked in a similar way and offered as prashad. I cooked this Mutton curry taking cues from Rogan Josh and my Mother's tip of using asafoetida+ginger to temper purely vegetarian curries. I have used whole Garam Masala and the Garam Masala powder just like we do for our regular mutton curry. For the wet spice paste, the very Bengali jeere-dhone baata, I have taken Kashmiri liberty and added some fennel seeds. Fennel seeds was probably not used in Bengali mutton curries. This dish is cooked in ghee in many recipe, however I have cooked it in Mustard Oil and added little ghee towards the end. Cooking it in ghee will definitely add more flavor. The Mutton Curry was truly flavorful delicious. You wouldn't miss the garlic and onion at all in this dish. However it tastes best when had the same day as cooked and it does not keep well in the refrigerator. Buy and wash goat meat thoroughly. Add all ingredients listed under Marinade and toss the mutton pieces in all the spices so that all of them are coated with spices. Now add the chopped tomatoes. Saute for a minute. Add the mutton pieces, reserving the marinade liquid for now. Add this yogurt+masala to the meat. Stir and mix the spices and mutton. Cook at medium heat for around 15 minutes, stirring frequently. Now transfer everything to a pressure cooker. Add Garam Masala Powder, Nutmeg Powder and Mace. Mix well. At medium heat let the gravy simmer and come to a boil. Taste for seasonings and add salt/sugar as needed. Put the lid on the Pressure Cooker. Cook for 5 whistles. For Futura type of Pressure cooker, cook for 10 minutes after full pressure. However I want to know how was marinating practices without refrigeration back in those days. Loved the addition of tomato ..